I'm pleased to announce another new addition to our taxonomy library designed specifically for the higher education market. The WAND Higher Education Taxonomy has 959 categories and 233 synonyms covering topics of importance to a college or university. 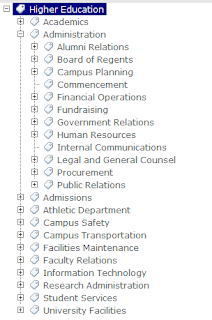 The taxonomy covers academics, university administration, admissions, athletics, campus transportation, facilities, student services, faculty relations, and more. 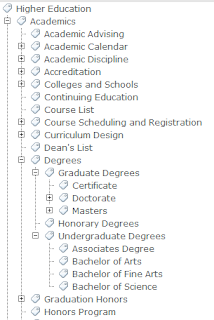 This taxonomy can jump start a taxonomy or metadata initiative for a college or university. Institutes of higher education are complex organizations with a lot of functions outside of simply academics. 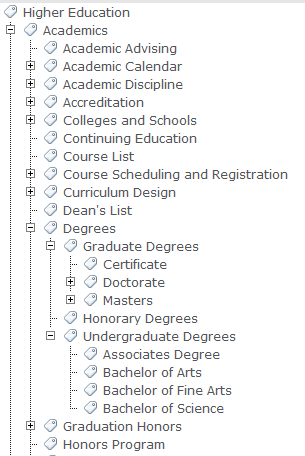 The WAND Higher Education Taxonomy reflects this complexity and is ideally suited as a metadata model for unstructured information at a university. Using a pre-built taxonomy can save a huge amount of time and frustration versus building one from scratch. 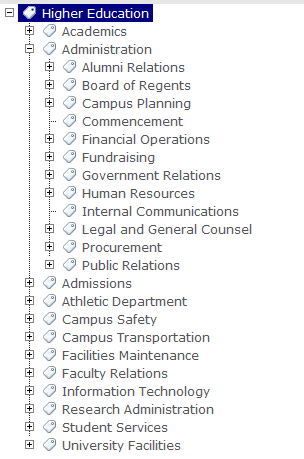 If you are a college or university with a SharePoint 2010 project, you should definitely look at this taxonomy to populate the term store and get going on tagging documents. And, this taxonomy can add value to any software application which supports taxonomy.